Villas At Timber Lake Fountain Lakes Condos: The wow factor is in play!....totally renovated in 2014.... former model with super private setting lives like a single family home.... You'll love the spectacular kitchen with 42" staggered cabinets, granite counter-tops, stainless steel appliances, and stunning tile floors which run continuously throughout the home. The intercom system is great for playing music throughout the villa, even in the lanai! Low fee's and great amenities including a 9 hole par 3 golf course is a tough combination to beat! Short walk to the pool & clubhouse too! Enjoy the walking path, tennis court, dedicated pickle ball courts & happy hour at the clubhouse on Friday evenings! Mahjong, bridge, cards its all here! All this with a prime location west of 41 across the street from the awesome Coconut Point Mall! 15 minutes to the beach! Villas At Fountain Lakes Fountain Lakes Condos: Look no further, this is your new SW Fl gated community villa, offering 3 bedrooms, 2 baths, 1 car attached garage, lovely screened lanai + balcony off the upstairs master suite overlooking a lovely private landscaped area. Beautiful wood flooring, updated kitchen, casual great room and community pool just around the corner for some exercise and socializing with your neighbors after a round of golf, biking or walking the community. Fountain Lakes community is located in the HEART of Estero, shopping, formal & casual dining within minutes of your front door. Sandy white beaches south off Bonita Beach Road and the Estero Bay Back Water providing unlimited wildlife, boating and beaching to take advantage of the wonderful natural resources Southwest Florida offers. Villas At Fountain Lakes Fountain Lakes Condos: Great opportunity to own in the highly desirable community of Fountain Lakes. Attached villa offers a premier long lake view and is steps away from the community pool. Open floor concept with cathedral ceilings/large master bedroom really makes it feel spacious. Other features include new Reem A/C and Airhandler(2015), new plumbing repiped(2015), refrigerator(2017), washer/dryer(2017) and water heater(2018). 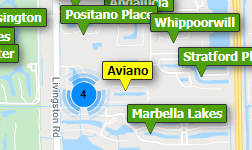 Fountain Lakes is conveniently located west of RT41 in Estero and across from Coconut Point Mall. Community offers a variety of amenities including two swimming pools, billards, and a 9 hole 3 par golf course. Villas At Fountain Lakes Fountain Lakes Condos: BEAUTIFUL LAKEFRONT VILLA WITH A SW EXPOSURE AND ATTACHED GARAGE ACROSS FROM COCONUT POINT. 2 BR, 2BA , LARGE LIVING ROOM WITH ATTACHED 1 CAR GARAGE. AMMENITY FEE INCLUDES GOLF, TENNIS, CLUBHOUSE, EXERCISE ROOM, POOL., SHUFFLEBOARD, BOCCE BALL, BASKETBALL, HORSESHOES, BILLARD ROOM, PICNIC GROUNDS PLAYGROUND, CARD ROOM, LIBRARY. The Greens Fountain Lakes Condos: LOCATION, LOCATION!! Completely renovated, highly upgraded, 1st floor unit in The Greens at Fountain Lakes. From the newer A/C & water heater, to the new tile floors & crown molding, to the bath renovated with new granite vanity & custom-tile shower, this home is move-in-ready for its lucky future owner. Fantastic open floor plan with renovated kitchen includes contemporary custom cabinetry, new granite counters & backsplash, custom recessed ceiling, new light fixtures & newer appliances. Located directly across from Coconut Point Mall and halfway between Ft Myers and Naples and close to the RSW airport. The Greens at Fountain Lakes has it all!! Living at the Greens you will feel like you are on vacation! The Greens offers a 9-hole golf course, 2 swimming pools, 2 tennis courts, shuffleboard courts, exercise room, billiards and more! Perfect location for the water enthusiast, minutes to the Imperial River & Estero Bay with kayak/canoe rental & easy access to world class beaches. Enjoy LOW HOA FEES with NO CDD. Come see what the Greens at Fountain Lakes has to offer! The Greens are great rental investments as well as a new place to call home. The Greens Fountain Lakes Condos: This beautifully renovated first floor, one bedroom condo is located in the highly sought after Fountain Lakes community in Estero! The condo comes turnkey furnished and is tastefully decorated in transitional furnishings. The kitchen features granite counter tops. You'll also want to experience the luxurious bathroom remodel with a frameless glass shower enclosure, marble tile and upgraded vanity. The living room offers a queen size Murphy bed and the screened-in lanai features a storage unit. The Greens at Fountain Lakes boasts an abundance of amenities including gated entry, pool, 9-hole par 3 golf course, fitness center, tennis court, biking/jogging path and clubhouse. This amazing location is west of 41 and across from Coconut Point Mall and also within close proximity to SWFL International Airport, Hertz Corporate Headquarters, Miromar Outlets, Bonita Beach, Estero River and much more.Call today to tour this piece of paradise. The Greens Fountain Lakes Condos: Great location on this 2 bedroom, 1 bath 2nd floor condo directly across from Coconut Pointe Mall. Close to area beaches, nature trails, great shopping, dining and entertainment. Enjoy all the amenities of Fountain Lakes, including the free 9 hole executive golf course. Need professional assistance selling your property at Fountain Lakes Estero? Find out how an Area Specialist can help to generate more property exposure in order to get the most money for your investment in the least amount of time.